It’s easy to think that the Arizona Fall League is a league full of All-Stars. This is likely due to the prospect power and the marketing. It is a league unlike any other fall developmental league. However, despite the big names going to Arizona, teams aren’t necessarily sending their best 6-8 prospects. This is the case with the Atlanta Braves. Despite the lack of high profile guys like Ian Anderson, William Contreras, and Drew Waters, the Braves contingent still boasts some big names that could use Arizona to position themselves near the front of the Braves top prospects rankings. Two of the bigger profile guys heading out west are Cristian Pache and Kyle Muller. Pache, 19, and Muller, 21, both finished the 2018 season at AA. 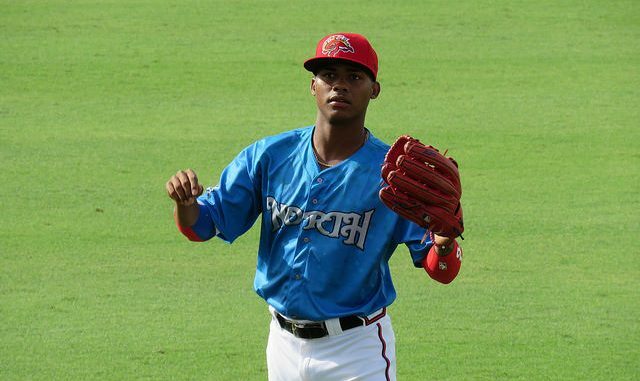 Pache has three 70+ tools on the 20-80 scouting scale and is one of the more exciting prospects in all of baseball. While the bat is the tool that is lagging, he has an athletic frame that can 15-20 pounds of muscle without sacrificing his quick-twitch athleticism and 70 grade speed. Pache is considered not only the best defender in the minors but the best CF in the entire organization. I’ve even been told by a scout that his defense is better than Byron Buxton‘s. High praise for the teenager who is still learning to hit. At the plate, Pache has plus bat speed and the body and present strength grades his raw power at 60. He is an aggressive hitter that swings at everything which currently limits his hit tool and hurts his walk rate. He has a good feel for the barrel and makes consistent contact, however, he puts himself in pitcher’s counts, so a lot of the contact is weak. Arizona will be a good chance for Pache to continue to work on getting into hitter’s counts and using his strong frame to drive balls. Kyle Muller is a big LHP with a protoypical pitcher’s frame. He pitched across three levels, excelling at each. His best work was in AA, where he held hitters to a .206 AVG and posted 0.97 WHIP in 29 IP. Muller pitches to contact and while his FB touches 96, he often sits low 90’s during starts. He has a plus curveball, an over-the-top hammer, and a change-up. Muller has a chance to really make the leap into the Top 100 with a dominant performance. With the Braves being so loaded in the pitching department, Muller is often overlooked. This fall he will get his chance to separate himself from the pack. The rest of the Braves’ AFL group consists of RHP Jeremy Walker and lefty RP’s Thomas Burrows and Adam McCreery. McCreery has seen time in Atlanta while Burrrows has a chance to reach the Atlanta pen in 2019. Burrows has a wipe-out slider but command issues have limited his effectiveness. Like Muller, Burrows did his best work at AA Mississippi. Jeremy Walker pitched the bulk of the season at High-A Florida. He has an average fastball with fringy off-speed offerings. He knows how to pitch and has enough pitchability to maximize his lack of stuff. Of note, Walker pitched 8 shutout innings in his only start at AAA Gwinnett. Offensively, Ray-Patrick Didder, Braxton Davidson, and Izzy Wilson will be joining Pache. Didder is an athletic SS with 80 grade speed and flashes plus defense. He doesn’t profile for much power and struggles to make consistent contact. He is overly-aggressive and the lack of walks limit his effectiveness. Braxton Davidson hit 20 HRs and it’s easy to forget he is only 21. However, when your strikeouts are higher than your batting average 213 to .171, there is little to become excited about. Rounding out the group is Izzy Wilson. Wilson is a tooled-up outfielder that really struggles to make contact. He has plus speed and the body and power projection are enticing. At only 20, he is still raw, but the athleticism and body projection are enticing.